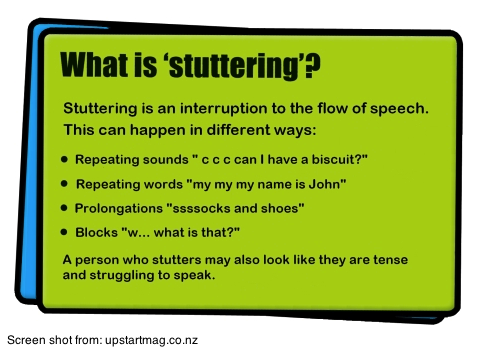 What is Stuttering? Is it the same as Halting and Jarring Speech? In a previous post, I discussed the problem of halting and jarring speech noticed in some Kerala IT professionals while speaking in English. 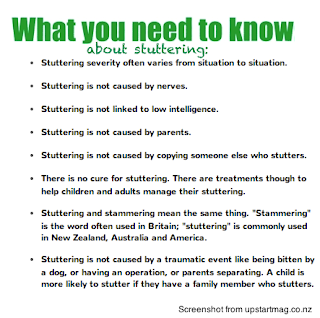 I was asked by a reader of the blog if that is the same as stuttering. This is indeed a good question. My initial reaction is they are related, but not the same thing. 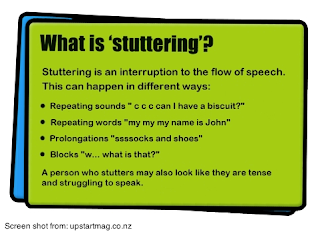 While stuttering behavior can produce halting and jarring spoken English, stuttering often creates repeated sounds, words, or phrases. Those who simply halt and jar their speech may not be repeating sounds, words or phrases. Hello. M-m-m-my name is C-c-c-inil. Ggggood mmmmmorning Ronald. Today wwwwwe wwwwill be discussing the ddddevelopment teams ppprogress. Hello Pat-Pat-Patricia. How was your Lab-Lab-Labor Day week-week-weekend? Hope you had fun. Good afternoon team. Today we will... Today we will... Today we will discuss the shopping cart... shopping cart... shopping cart.... we are coding. We will-um-get back to you with further-um details-um-soon-um. I think-a we-a have to fill-a out-a the forms-a before we-a can-a test-a it completely. We have already discussed how to coll-coll- (pause) work together on this project. We should meet with the client (pause) I found the e-mail from Swathi about our team outing. One may not have all of these behaviors or symptoms. If you exhibit more than two of the vocal distortions, you may have a case of stuttering. I am not a speech therapist. If you feel you have this problem and want a proper diagnosis, consult a speech therapist. Do my speech problems cause problems when trying to communicate to my colleagues or clients? Do my colleagues or clients avoid speaking with me (in English) because of my speech challenges? Have these behaviors prevented me from speaking up in meetings or at work during crucial moments? Do I find that these behaviors prevent me from being understood clearly by others? Do others ask me to speak clearly or repeat? If stuttering or stammering behaviors pervasively impact your overall quality of communication and prevent you from achieving the best you can achieve with your colleagues or clients, this could be a problem you should look into resolving. If you are still wondering if you stutter, watch this video. It's a before and after account of a boy who stuttered (in English, his native language), sought out help for it, and solved the problem. Do you notice the difference in his speech before and after he found help? This video is not produced by Authentic Journeys. If you think you may have stuttering problems, but really want hard evidence, I suggest that you record yourself during client meetings or internal team meetings where you have to speak in English. After recording it, listen to it later. Use the checklist above to assess if you make any of the vocal mistakes characteristic of stutterers. How frequently does it happen in your conversation? How does it impact the listener's interaction or understanding of you? Compare your communication style to those who do not have these behaviors. Do the clients or colleagues engage with them differently? *Take note, I am mentioning specifically to readers of this blog to be observant of their behaviors while speaking in English. For most of the readers of this blog and my clients, English is their second language, and not a language they may get many chances to speak outside of work or in casual settings. It is possible that stuttering happens in their native languages, but I am not aware of this as I am not studying them speaking in their native languages of Malayalam, Hindi, Tamil and other Indian languages. While various professionals suggest different approaches to overcome stuttering, here's something I found on YouTube. This young man is a previous stutter who shares advice and tips on overcoming stuttering. These ideas are different than most you find out there, though I have suggested these ideas to other clients to overcome different speech challenges, and they have seen good results in trying these solutions and later adjusting the application appropriately. Do you have a stuttering problem? What are some tips and advice you would like to share with others who stutter? Do you stutter in your second language? How did you overcome that? Jennifer Kumar is a communication and leadership coach helping Indian IT professionals achieve their maximum potential through clear communication and cultural knowledge. What does it mean to have a halting or jarring way of speaking?